Maggi Hot Heads: Green Chilli, Peri Peri & Barbeque Pepper: Review & Price. 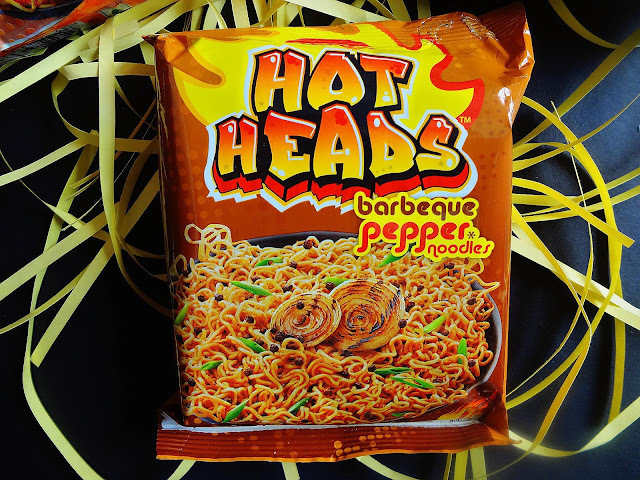 YouTube videos recently went viral about a Spicy Korean Noodle which burnt away the mouths of every possible being! 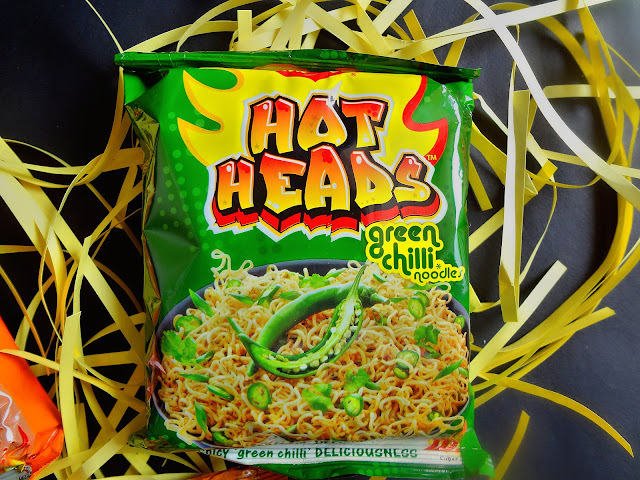 And then, Maggi launched it’s ‘Hot Heads’ variant. Instantly, I had comparisons in my mind. Though I’ve not really tried the Spicy Korean Noodles but I believed it’s a war declared by Maggi in the race of offering the spiciest noodles. All black background and dazzling flames of fire comprised the commercial. Since ages I’ve been a Maggi fan and the new advertisement was like a soldiers’ call to the war in the crises! I looked out for these in 3-4 shops. The Chicken variant was available in 50% of the shops but I have no clue why they detested the vegetarian version. When, I finally landed onto a shop with these vegetarian ones, I bought these three instead of trying just one! 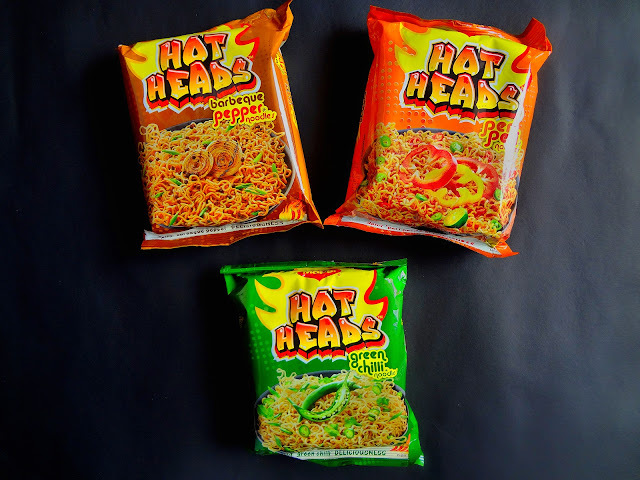 So let’s see how the new Maggi Hot Heads Fared! Green Chilli: The packaging claims it to be the spiciest. I had my expectations high! 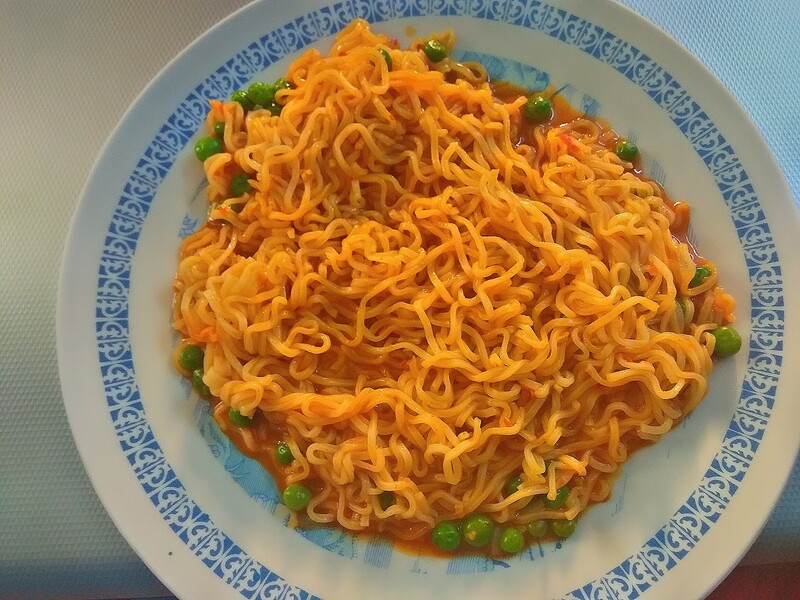 Though I usually add in extra salt and spice to my maggi, I steered away this time because I am young and I don’t intend to die so soon! 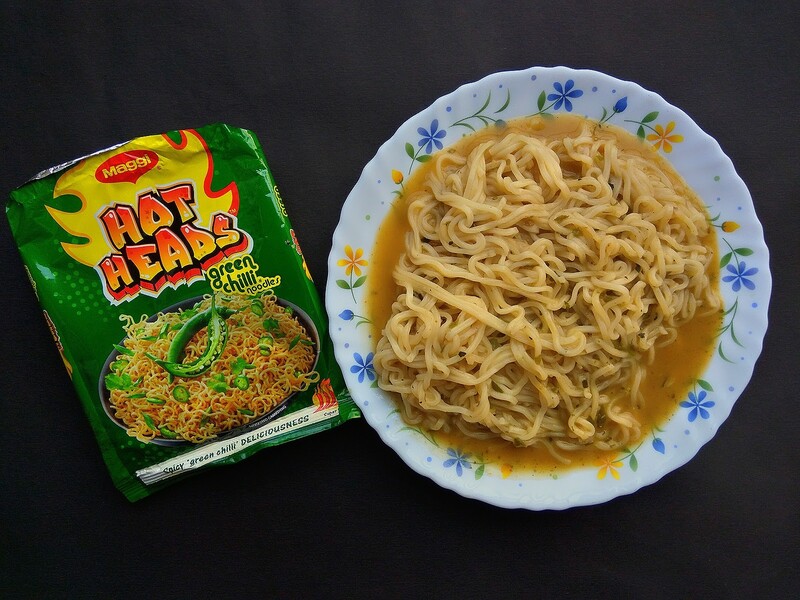 *LOL* The cooked maggi looks faintly green in colour due to its main green component. I gulped it down quite easily and there’s not really a spice hit that you get on eating this. The spice gets to you after you’ve eaten it. That too is acceptable and lasts long only for 5 minutes or so. It might give a slight burning sensation around the mouth, but you can wash it off easily. In short, people with a spicy palette would like it but if you desire too spicy an experience, then you still need to rely upon your kitchen’s spices. Peri Peri: So this time, I craved for peas and seriously I look out for ways I can incorporate them into my snacks or meals! I threw them in the pan along with maggi & added a pinch of salt and chilli powder. It tasted pretty good and spicy. 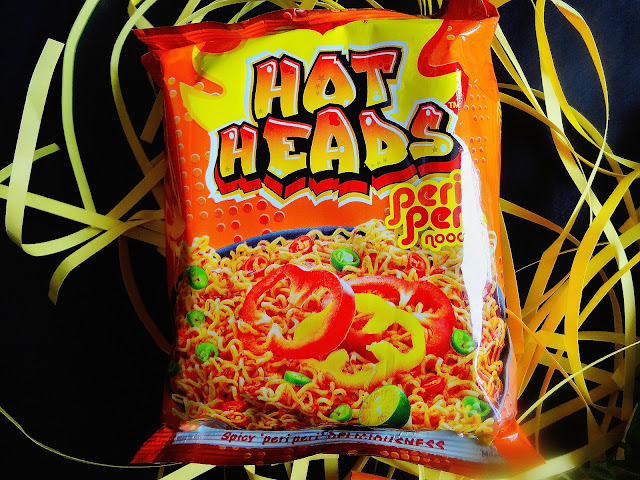 Again with this one as well, the spice factor emerges at its peak once you are done slurping upon all your noodles. After eating, I felt as if I truly ate something Indian with appropriate spice into it. It kinda tastes like that peri peri masala from Mac Donald’s Peri Peri fries which were available only for a limited period! *wink* As far as the appearance goes, the tastemaker looked different with more of orange shade into it which showed up on the maggi as well once it was cooked. Though faint color difference in all three variants can be detected but it is really not that drastic. Barbeque Pepper: This one is kinda bland to taste. You can’t really figure out that it is a pepper variant. While in other, the main ingredient does stand out but not with this variant. It’s no doubt spicy and like the other ones, in 'barbeque pepper' as well your tongue would feel attack of the spicy ingredient post eating. While slurping, the same slight sweetness lingers. 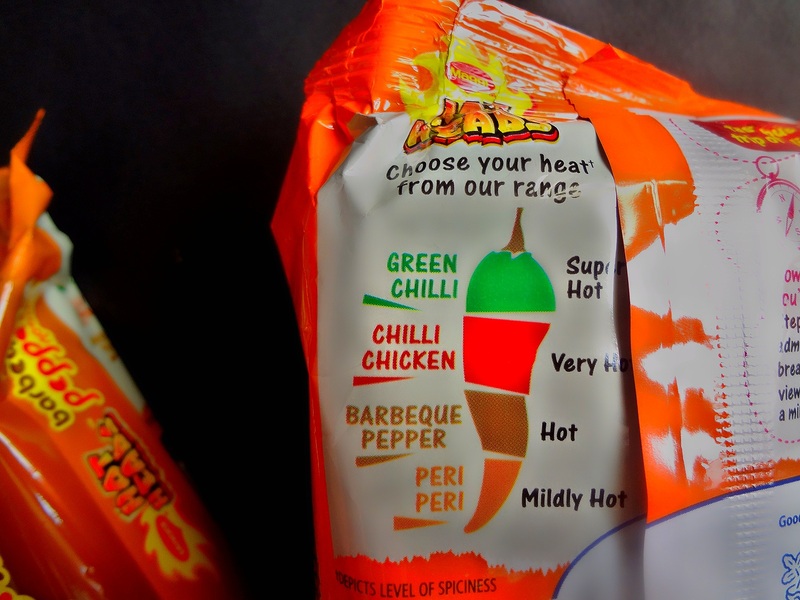 Final Verdict: Overall, I think these are not really burning spicy that you’d end up crying but just enough for our Indian taste buds. People who cannot tolerate spice, may wanna stay away! For those who don’t mind little zing to their food palette can definitely give it a shot! Ironically, people like me still think of adding little more tastemaker/spices! Have you tried these yet? If yes, which one was your favourite? Also, what instant noodle do you enjoy the most?